After following the PBR Introduction, it is a good time to learn more about the PBRMaterial. This will be the only picture of the documentation. As a real sample would be better than a picture, please, do not hesitate to click on the eye aside of each playground links to see the live examples embedded in the page. The entire documentation should help you deal with most of the PBR Material setup. As the PBR material is embedded in the BabylonJS library, please, follow the basic tutorial in order to create your first page using the framework. 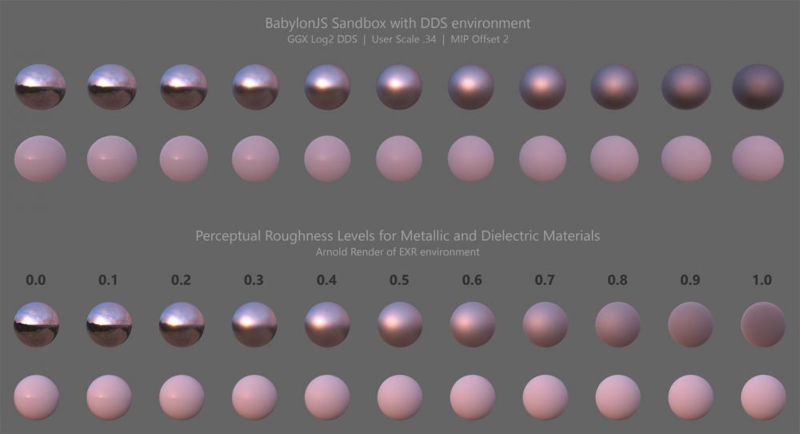 As the two main PBR Materials e.g. SpecularGlossiness and MetallicRoughness, are intended to be simple, their number of properties is pretty small to stay user friendly. From time to time, you might still be missing a feature or willing to go a bit deeper. The PBRMaterial is here to address this concern and can work in either a Specular/Glossiness or Metallic/Roughness workflow. This document will only address the differences between the PBRMaterial and its the simpler versions. To start with the MetallicRoughness, you can take a look at the documentation. useRoughnessFromMetallicTextureAlpha: the metallic texture contains the roughness information in its alpha channel. useRoughnessFromMetallicTextureGreen: the metallic texture contains the roughness information in its green channel (useRoughnessFromMetallicTextureAlpha needs to be false). useMetallnessFromMetallicTextureBlue: the metallic texture contains the metallic information in its blue channel (it is considered in the red channel by default). useAmbientOcclusionFromMetallicTextureRed: the metallic texture contains the ambient occlusion information in its red channel. useAmbientInGrayScale: the ambient occlusion is forced to read only from the red channel of the ambient texture or from the red channel of the metallic texture. To begin with the SpecularGlossiness you can start with this documentation. microSurfaceTexture: Enables the ability to store the glossiness on the red channel of a separate texture. useAlphaFromAlbedoTexture: the opacity information is contained in the alpha channel of the albedo texture. useMicroSurfaceFromReflectivityMapAlpha: the reflectivity texture contains the microSurface or glossiness information in its alpha channel. Another interesting addition to the reflection is the ability to keep the most luminous part of the reflection over transparent surface... Yeah, it does not make much sense... Actually, if you look through a window at night from a lit room, you can see the reflection of lights or TV on the glass. This is the same for reflection in the PBR Material. A special property pbr.useRadianceOverAlpha = true; has been added to allow you to control this effect. Not only reflection (AKA radiance) but specular highlights can be seen on top of transparency. Refraction is a little bit like reflection (Please purists, do not kill me now, I only said a little) because it is heavily relying on the environment to change the way the material looks. Basically, if reflection could be compared to seeing the sun and cloud on the surface of a lake, refraction would be seeing weird shaped fish under the surface (through the water). As refraction is equivalent to how you can see through different materials boundaries, the effect can be controlled via the transparency in BJS. A special property helps you to do it, simply put pbr.linkRefractionWithTransparency=true; in your code and then the alpha will control how refractive the material is. Putting it to false leaves the alpha controlling the default transparency. You can still notice some reflection on your material. This is due to the energy conservation detailed later in the document. LightMaps are available in the same way they are in the standardMaterial by affecting a texture to the lightmapTexture property. This can also be used as a shadowMap instead by switching the dedicated control flag useLightmapAsShadowmap to true. The Processing Configuration can be applied directly on the material as explained in the image processing documentation. Always considering what "Nature does", we reconsidered the BJS light falloff effect in the PBR Material. Three main properties have been added to offer a better simulation of the lights. Compared to the BJS lighting model, instead of playing with an arbitrary range for the lights, the light impact will decrease proportionally to the inverse of the light distance squared. So, the further you are, the bigger your intensity will need to be to reach a surface. // Default automatic mode best fitting with the light type. Light Radius has been added as a property of each light and controls the fact that in real life most of the lights are not a single point. Why? Simply because if your material is really glossy, each specular highlights (from the direct lights) will only be seen as a simple dot. This uses internally a lot of approximation like Tan(theta) is almost theta for small angles so if you try to put bigger radius than a tenth of the light distance you will not see the desired effect. You can find below a few notes which could be helpful during the creation of your scenes. Glossy materials are subject to Specular Aliasing artifacts. These artifacts are usually visible as bright dots flickering on meshes when animating the model or moving the camera. A big part of the lighting in PBR is assured by the environment texture. This provides two kinds of light contributions, radiance which could be considered alike reflection and irradiance which could be thought as the diffuse component of the Image Based Lighting. In case you are creating a model rough and not metallic (in metallic workflow) or not specular (in specular glossiness mode), most of the illumination will be provided by both the analytical lights and the environment texture. In Babylon JS in order to optimize the computation of the irradiance, it is computed in the vertex shader and interpolated in the fragment. Unfortunately, this prevents us to rely on the normal map to realize the computation and then might introduce artifacts by not emphasizing the bumpiness of the surface. It is most of the time acceptable but with rough none reflective material it changes a lot the visual result. You can see below on the left on rough none reflective model in the default configuration and on the right a model with forceIrradianceInFragment enabled. We were able to largely match the perceptual falloff from the Arnold ray tracer, while using a prefiltered MIP chain in the DDS ignoring the last two MIP levels. We have some deviation from the high roughness in the ray traced ground truth, but since fully rough materials don't really exist in the real world, there is no way to know if Arnold is right in these areas.